Before you start looking at repair options for your HVAC system, take a few minutes to read this blog. First of all, you want to make sure the cause of the problem isn’t something you can fix yourself. We would hate to come all the way just to flip a switch or change a thermostat setting. You can call your local HVAC company anytime your heating and cooling doesn’t work, but before you make the call, follow these heating and cooling troubleshooting tips. Check the thermostat. Make sure it is set to “heat” or “cool” and not affected by ghost readings caused by things like sunlight and drafts. You may need to change the batteries. If you have any questions about how to use your thermostat, refer to the owner’s manual. Check the air filter. The air filter should be clean, properly installed, and the access door should be fully closed. If the access door isn’t closed, some HVAC systems won’t turn on as a safety mechanism. Check the power. First, find your electrical panel to see if the HVAC circuit is receiving power. Then, make sure all of the power switches are on. There may be three: one on or near the indoor air handler, another one nearby in the room, and a third may be outside of the basement/HVAC room near the door or stairs. Check the outside unit. Remove any plants and debris that may be blocking airflow. Look for the outdoor disconnect box near the unit and make sure it is switched on. Learn more air conditioning and furnace troubleshooting tips. Set the thermostat to “heat” and at a low temperature setting so your furnace doesn’t receive any signal to turn on. Wait until the furnace is completely off. Now, go to the breaker box and flip the corresponding furnace breaker off. Leave the power off for about 1 minute and then flip the breaker back on. Now, wait about 30 minutes to turn your HVAC system back on. If cooling, set the thermostat to “cool” and at least 5 degrees lower than room temperature. If heating, set the thermostat to “heat” and at least 5 degrees higher than room temperature. When all else fails, contact your local service company and tell them what’s happening and what you tried to do to fix it. Are You Frequently Calling for HVAC Repairs? One thing you want to consider before paying for a professional HVAC repair is if you’d be better off replacing the unit. By replacing now rather than continuing to pay for repairs, you can save a lot of money in the long run. After all, you are going have to pay for the new system sooner or later, so you may as well stop repairing an aging system and replace it with one that is reliable and energy efficient. A general rule of thumb is if the repair is 50% or more the price to replace it, replace it. 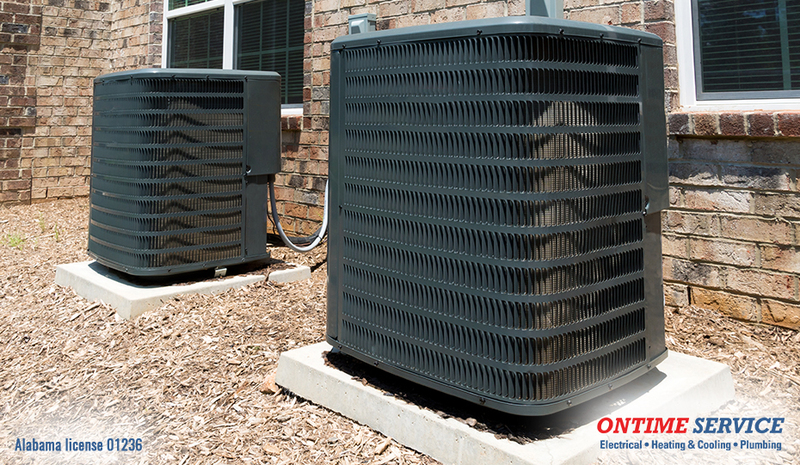 Learn what to consider when shopping for a new HVAC system. According to the Energy Department, you can save around 10-30% on your energy bills with annual heating and cooling maintenance. Some studies have shown that annual professional maintenance helps retain up to 85% of the manufacturer’s energy efficiency claims for the lifespan of the unit. Wouldn’t it be great to be able to call a trusted service technician and have him show up same day for reduced service fee? In addition to discounted service visits and repairs, an HVAC maintenance plan ensures you receive regular tune-ups twice a year. Every fall and spring, a service representative will call you to schedule your annual heating and cooling tune-up. Your service plan will renew every year until you choose to end. Call OnTime Service or schedule online for your next HVAC service in the Birmingham, AL area: 205-942-1405. Our experienced team of electricians is fully trained to handle any heating and cooling system.